From @Reuters -- Oil prices broke above $40 a barrel on Wednesday, driven by anticipation that the world's largest exporters may agree as soon as this month to freeze output, which could accelerate a decline in the largest global build in unwanted crude in years. Russia's energy ministry said no date or place had been set for a possible meeting, but this had little impact on the oil market. "The consensus is for supply and demand to improve in the second half of the year. The problem was always with the first half .. which is heavy," Petromatrix crude oil strategist Olivier Jakob said. "Add all this momentum for actually increased talks between OPEC and non-OPEC - if there is a freeze agreement of some sort, then it could (form) the bridge to the tighter supply/demand balance in the second half, so I think that has definitely helped to support prices." 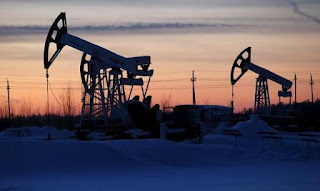 Oil prices have risen by around 25% since Saudi Arabia, Qatar, Venezuela and non-OPEC exporter Russia said in mid-February they would leave supply at January's levels if there was enough support from other producers. Nervousness is running high in oil-dependent nations whose budgets have been tattered by weak prices, such as Algeria, which warned the recovery in crude was "very unstable" and could reverse. Credit ratings agency Moody's warned of the potential for more curtailments to output from defaults arising from the low oil price, which in January was at its weakest in nearly 13 years. Analysts at Bernstein said poor economics could lead to more oilfield closures. "Only two months into 2016 we find cumulative shut-in production has already reached 60,000 bpd and up to 260 million barrels of reserves," Bernstein said. US output is falling, but slowing demand and a global production and storage overhang are capping any potential for bigger price gains.